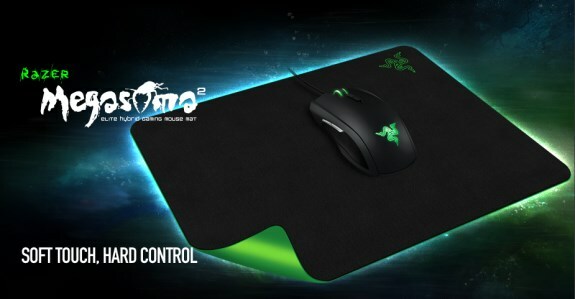 Razer presents the Megasoma 2, a new hybrid silicon soft/hard mousepad. It measures 230mm x 350mm x 2.3mm and has a non-slip rubber base. It will be available soon for $39.99 (39.99EUR). Razer, the world leader in high-performance gaming hardware, software and systems, today announced the availability of the Razer Megasoma 2, a hybrid gaming mouse mat combining the stability and performance of a hard mat with the flexibility and comfort of a soft surface. The Razer Megasoma 2 is able to deliver the benefits of both hard and soft surfaces as a result of its silicon-based construction. Just like a hard mat, the silicon is taut and stable for consistent mousing performance and precise motion control. At the same time, the Razer Megasoma 2 is flexible like a soft mat, giving users a cushioned feel underneath their hands by virtue of its cloth-top layer. The Razer Megasoma 2 offers many improvements over its predecessor, including an ergonomically thinner profile, in addition to an anti-static treated surface and anti-fraying edges for increased durability.